Metallic Temporary Tattoo Jewelry in Gold and Silver by ShimmerTatts: bracelets, necklaces, rings, & body art temporary metallic tattoos last 3-6 days. See how fun our ORIGINAL ShimmerTatts jewelry tattoos can be! 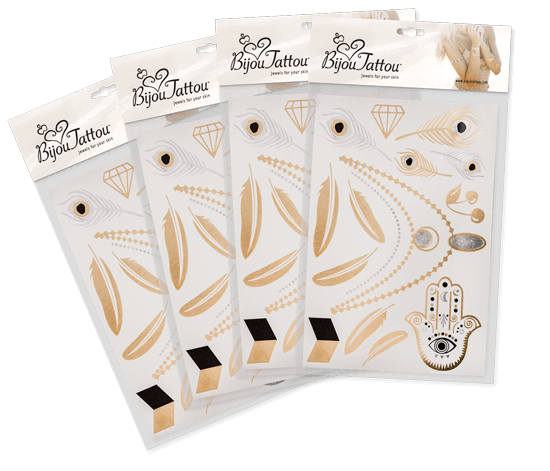 The best metallic temporary tattoos jewelry for parties, outdoor festivals, fairs, concerts, weddings, beach, poolside, sporting events, dates, yoga, work, and even Sunday brunch. Wear them anywhere and anytime you want to add a splash of sparkly fun. But we warn you, our gold and silver temporary jewelry tattoos by ShimmerTatts are addictive!